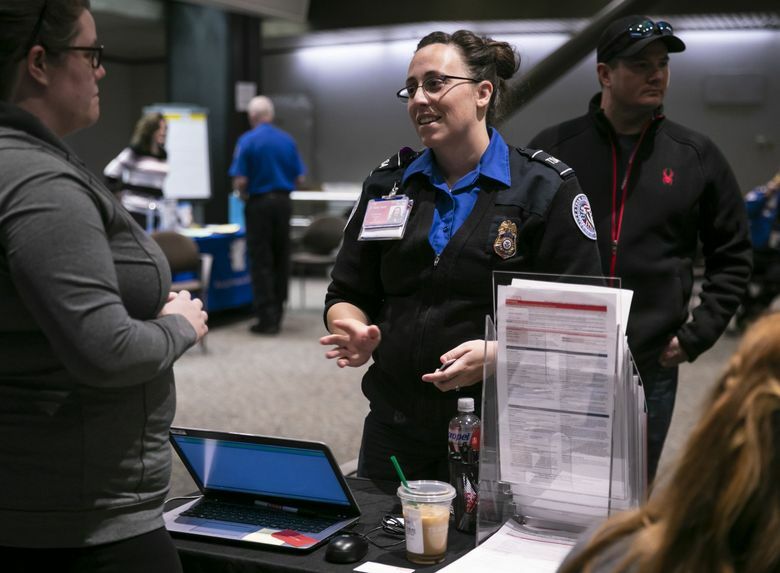 At a resource fair organized by the Port of Seattle, credit unions, nonprofits and utility companies told federal workers how they could access short-term loans, late bill-payment support and emergency assistance. Federal workers at Seattle-Tacoma International Airport who already were living paycheck to paycheck say the government shutdown has taken them to the brink of financial instability, as they consider loans, temporary jobs and unemployment benefits to get by. Brianna Specht’s husband is a Transportation Security Administration (TSA) employee who has been working without pay, and the two have a 6-year-old daughter. The situation has left Specht and her husband feeling helpless, as they worry about how they’ll pay rent if the shutdown continues. 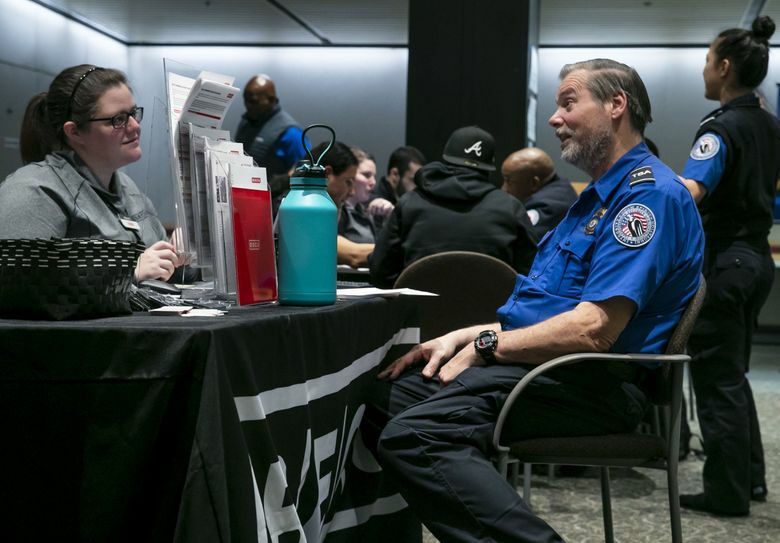 At a resource fair Friday organized by the Port of Seattle, credit unions, nonprofits and utility companies told federal workers such as Specht’s husband how they could access short-term loans, late bill-payment support and emergency assistance. Nonprofit Within Reach signed up two workers for food stamps, and the United Way of King County gave workers information about an upcoming eviction-prevention event. The partial federal government shutdown will soon enter its fourth week, as President Donald Trump continues to press Congress to fund a wall on the nation’s southern border — a move Democrats oppose. Friday marked the first missed paycheck for many of the roughly 800,000 federal employees who are furloughed or working without compensation. Around 2,000 workers are affected at Sea-Tac Airport. For Specht, the shutdown has overshadowed normally happy events such as Christmas and her birthday. The family has meager savings to fall back on, and the bank has been calling every few days about a payment that’s past due, she said. They’re living off money Specht makes baby-sitting, and help from her father, who is retired but started working a minimum-wage job to help the family get through the shutdown. Across Washington state, federal workers have found themselves in positions they didn’t expect. Some are using food banks and applying for special low-interest loans, while others have considered applying for government benefits. Monika Warner, president of a union that represents professional aviation safety specialists, has started looking into unemployment benefits, as well as part-time jobs she can drop once she’s called back to work. Warner said she hasn’t been able to sleep, kept awake into the early morning hours calculating her financial position. A single mother, with two teenagers living at home, she wonders how she’ll continue to pay the mortgage, utilities, credit-card bills, car payments and insurance for her children. The shutdown has reportedly led to an increase in TSA workers who have called in sick, causing delays at some airports. Port of Seattle officials have said that hasn’t been the case at Sea-Tac, which has seen normal security-line times. It took most passengers five to 12 minutes to get through security Friday, Port of Seattle spokesman Perry Cooper said in an email. Roger Smith, who has been a TSA employee for around 17 years and on Friday was looking into getting a loan, said that’s exactly why he’s continued to show up to work during the shutdown.